Primo Giorno Di Scuola Bambina [C7173] - $12.22 : Yarn Tree, Your wholesale source for cross stitch supplies. 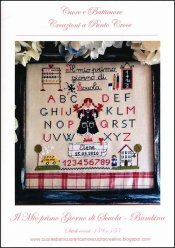 Cross stitch pattern by Cuore e Batticuore. A school girl with letters of the alphabet surrounding her is featured in the middle of the pattern. On each of the four corners of the pattern features either a school game, school bus, school house with a teacher or a chalkboard with a math problem. Numbers 1-9 are towards the bottom of the pattern. Stitch count 159 x 155. Stitched on #7892 Belfast Linen Flax.